Share the post "Gig review: STONE FREE FESTIVAL – Day 2 – 02 Arena, London, 17 June 2018"
If day one of Stone Free exhibited classic rock at its heaviest and loudest, the Sunday – at least in the main O2 Arena- had a more progressive and thoughtful bent to it. 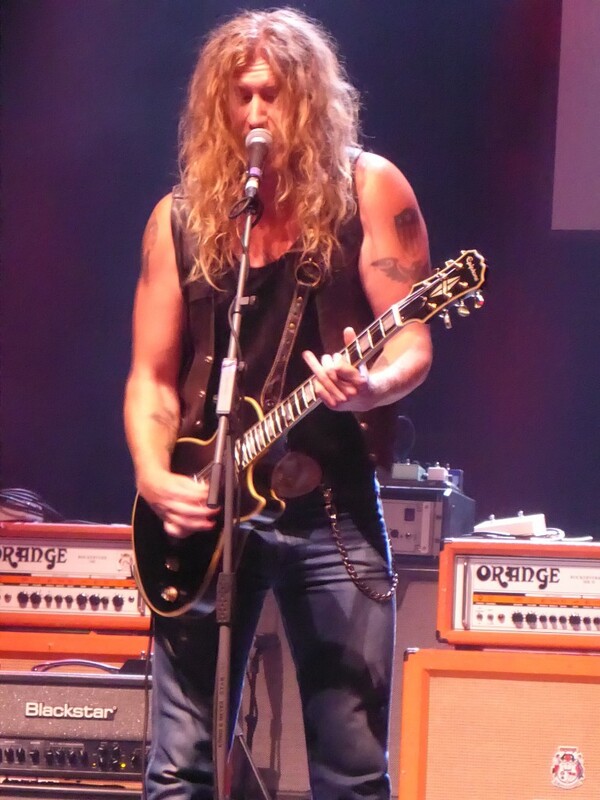 However the Orange Amps stage was still very much focused on the blues rock style that seems to predominate among the rising generation of classic rock bands. Indeed opening up proceedings in very impressive style were Kent rockers Stone Wire - the powerful vocal pipes of accented singer Sky Hunter backed by a band with two fine guitarists and a slight southern feel- songs like ‘Southern Honey’, the heavier ‘When The Crow Flies’ and ‘All That Matters’ all made a favourable impact. 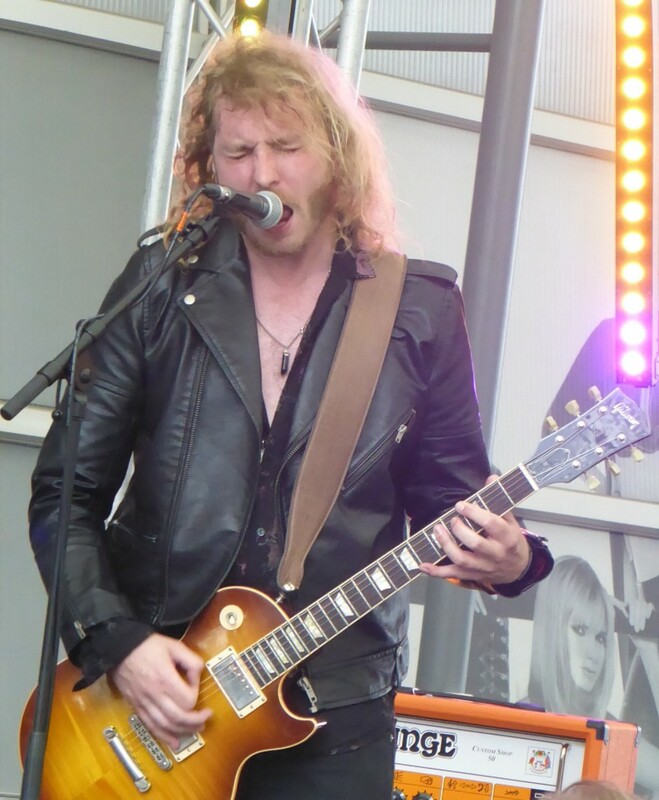 It was then a trip into a sparsely populated Indigo for Jared James Nichols who fast seems to be becoming a festival mainstay. It is easy to see why, as the Wisconsinite is a charismatic performer, whether pulling classic shapes as he jams with bassist Gregg Cash, or stepping away from the mike to banter jovially with the crowd. Songs like ‘Don’t Be Scared’, which built from grungy beginnings into something of an epic, and ‘End Of Time’, are closer in spirit to early US pioneers like Mountain and Grand Funk than the blues movement whose coat-tails he originally rode in on. However it was the more familiar ‘Can You Feel It’, with a riff straight off the classic Montrose debut and an audience singalong that was the most memorable. Unfortunately he got carried away with his own exuberance and his set was cut short as he had run out of time before his scheduled final number. 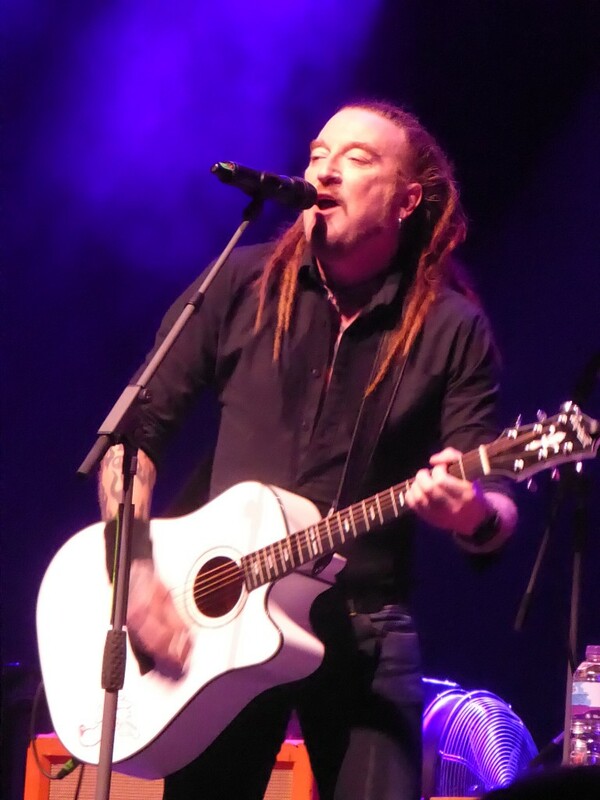 Ginger Wildheart came on stage to a vast reservoir of goodwill for this musical fanatic who has been battling his demons. However anyone expecting a reprise of the Wildhearts recent nineties nostalgia tour alongside Reef or Terrorvison would have been in for a surprise as he took the stage with an acoustic line up, featuring barely recognisable former Wolfsbane guitarist Jase Edwards whose playing was superb and a girl singer, Sophia. The songs were largely drawn from his new solo, country-flavoured album ‘Ghost In The Tanglewood’ and songs like the openers ‘The Daylight Hotel’ and ‘Golden Tears’ were what Americana would have been like had it originated in Newcastle rather than New Orleans. Indeed his tribute to his native South Shields ‘Caer Urfa’ could be viewed in other people’s hands as classic English folk music. Telling the stories behind the songs, he also got in digs at the state of world affairs and the unfriendliness of LA among others, while he ended with the one Wildhearts song perfectly suited to this format in ‘Geordie In Wonderland’. Thanking the audience by telling us ‘you’re not a bunch of c*nts, which is nice’ may have been an unusual way of putting it, but the warmth was mutual. Next up, rather inaccurately introduced by the annoying compere as glam metallers, Tyketto faced a slightly different challenge to usual – quite apart from a last minute arrival from Switzerland, they had to work harder to win over a festival crowd not wholly familiar with their work, instead of their more usual tight knit crowd of long-term loyal fans, of whom I count myself one. Pleasingly they played two new songs, indeed opening with the title track of new album ‘Reach’, enlivened by some absolute powerhouse drumming from Michael Clayton Arbeeny, but it was the classic melodies of ‘Burning Down Inside’ and ‘Wings’, part of the holy trinity of songs that open their ‘Don’t Come Easy’ debut, that got the best reception. Excellent guitarist Chris Green showed off his skills during ‘Rescue Me’ but a solitary low was ‘Lay Your Body Down’ where the band, with veteran bassist Greg Smith doing a fine job, went off into rather too lengthy a jam, before ‘Meet Me In The Night’ pulled things round and their usual high quality set concluded as Danny Vaughn commandingly led us through ‘Forever Young’, the song I always refer to as the melodic rock national anthem. I just had time to pop out, get a can from the craft ale stall and catch the headline set on the Orange Amps stage from rising Midlanders The Bad Flowers, who are building a name for themselves. The power trio generated some serious bottom heavy groove on the likes of ‘Secrets’ and ‘Rich Man’ while set closer ‘City Lights’ already has the feel of being their epic song. 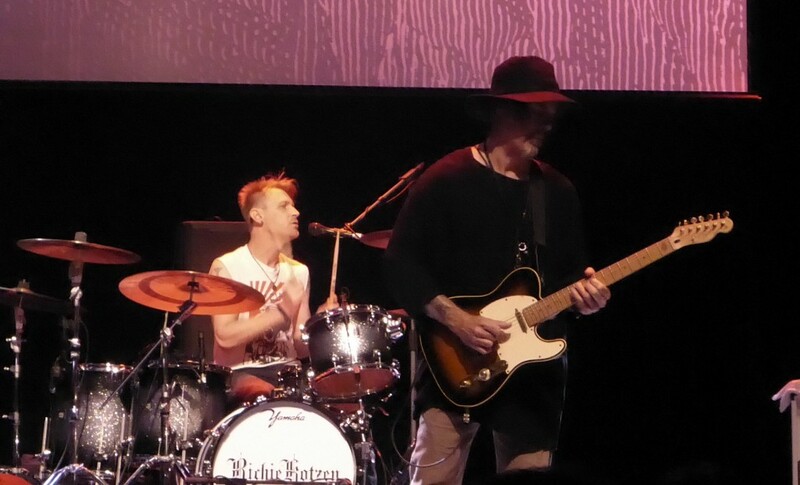 I rushed back into the Indigo to catch afternoon headliner Richie Kotzen. I’ve only sketchily followed the long career of the guitarist and singer, most recently with The Winery Dogs, but was mightily impressed with the tight groove that he and his three piece band laid down, with spacious arrangements that incorporated funk, soul and blues influences into a highly palatable and melodic mix. Very accessible songs like ‘Bad Situation’, ‘Love Is Blind’ and the slower ‘High’ had me thinking I had wrongly been missing out on his back catalogue while on ‘Fooled Again’ he even sounded like Glenn Hughes singing on one of Neil Young’s guitar wig outs. Nevertheless as the set wore on, the jams on songs like ‘Help Me’ became rather less purposeful and allied to his lack of on stage presence, face obscured under a wide brimmed hat, by the end he somewhat failed to hold my attention. The difficulties faced the previous day when punters were stuck in lengthy queues to enter the O2 Arena were nowhere in evidence as I walked straight in: sadly much of this was to do with perhaps the smallest crowd I have yet seen there and indeed the majority of the food vendors took the evening off. Opening proceedings were Anathema, the Liverpudlians whose doom metal days are long behind them. Instrumentalists the Cavanagh brothers, sometimes helped by a female singer in Lee Douglas, created an ambient soundscape of ambient prog that personally I found rather hard going. However, catching a couple of more prog-minded friends afterwards, they were drawing favourable comparisons to the likes of Pink Floyd and early Porcupine Tree. 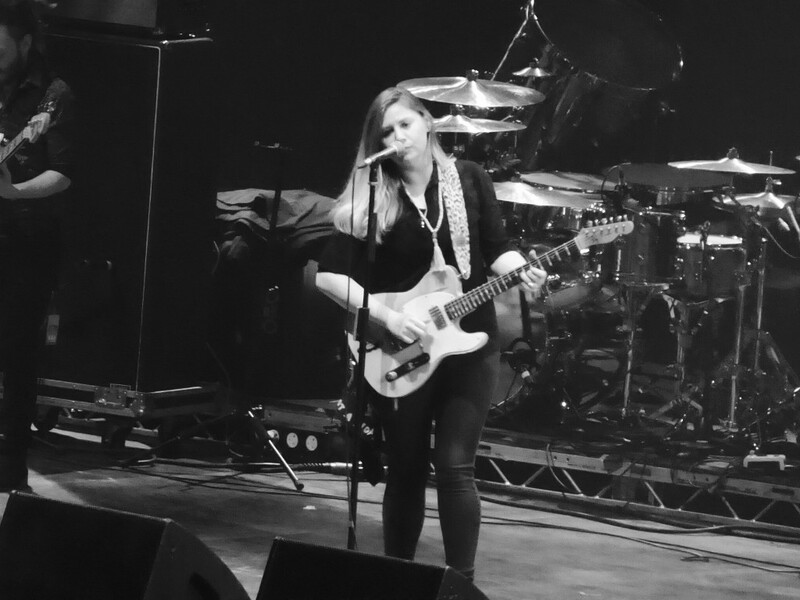 Though on stage host Jerry Ewing was stretching the boundaries of prog a bit too far, the bar was nevertheless raised when Joanne Shaw Taylor hit the stage. Always a fine guitarist, she has become a more rounded artist over the years and opening songs ‘Dying To Know’ and ‘Nothing To Lose’ had mainstream blues appeal, with former King King keyboard player Bob Fridzema a significant addition with his organ textures adding depth to the sound and complementing her smoky voice. ‘Diamonds In The Dirt’ was a long, jazzy-sounding epic, and yet one where her solo on a Gibson Les Paul demonstrated that of all the many fine blues players out there, her guitar style definitely has metal influences. After ‘Wanna Be My Lover’ which sounded like a cross between the Allmans ‘One Way Out’ and ‘River Deep Mountain High’, ‘Going Home’, as usual, ended a set which impressed, but which I couldn’t help feeling would have had more impact in a smaller venue before a more blues-orientated following. 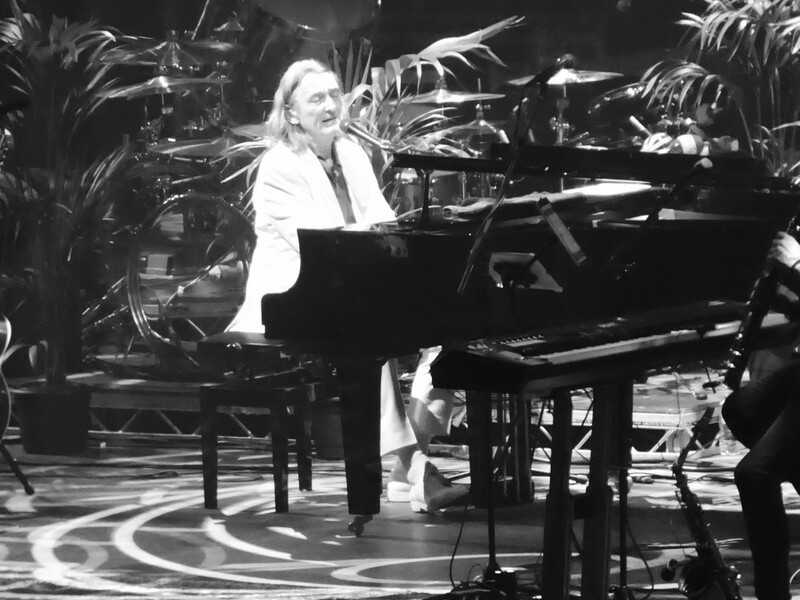 Next up on a rare UK appearance (though timed to coincide with announcing Royal Albert Hall dates next year) was former Supertramp lead singer Roger Hodgson. The backdrop made me think a local Amateur Dramatics Society was going to come on stage to perform South Pacific, but instead we were greeted by a cream suited figure with a gentle manner, a now transatlantic accent and an enviable mane of hair for a 68 year old. 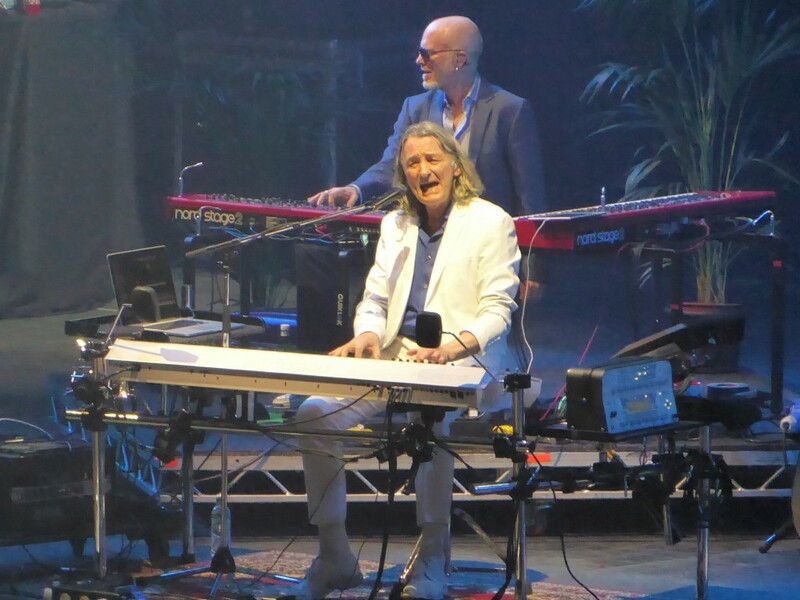 Wisely focusing on Supertramp songs in an hour long festival set, the likes of the opener ‘Take The Long Way Home’, ‘Breakfast In America and ‘The Logical Song’ were warmly received. Though guitar was virtually absent, he and a trio of keyboard players, one very effectively doubling on saxophone or harmonica created a lush sound above which that pure, high-pitched voice was as distinctive as ever. Encouraging a sing along, he even got people out of their seats during ‘Dreamer’ and ‘Give A Little Bit’, though they were interspersed by a album tracks including a multi-part epic in ‘Fools Overture’ that burnished his progressive credentials. He even sneaked in an encore, quipping that England had given him many things, including the inspiration for ‘It’s Raining Again’. I have never been a Supertramp fan but headed to the bar with a warm comforting glow, and consensus there was that his set had been the revelation of the weekend. The night was headlined by one of the two versions of Yes that are doing the rounds, for the second time in their lengthy career albeit with a different combination of personnel. Last year, Jon Anderson, Trevor Rabin and Rick Wakeman were touring under their own ARW banner, but since then the logo had been tweaked and the band were now going under the banner of Quintessential Yes. The main difference from the other touring version is that they feature the more commercially accessible eighties material, notably from ‘90125’, as proved when they opened with ‘Hold On’ with some meaty but intricate guitar work from Trevor, alongside the old favourites from Yes’ progressive heyday. Of the latter, ‘Perpetual Change’ was very impressive, as was ‘I’ve Seen All Good People’, combining typically proggy time signatures with some great, almost CSN-like harmony singing. The supporting cast of bassist Iain Hornal and drummer Lou Molina were equally impressive in this regard. 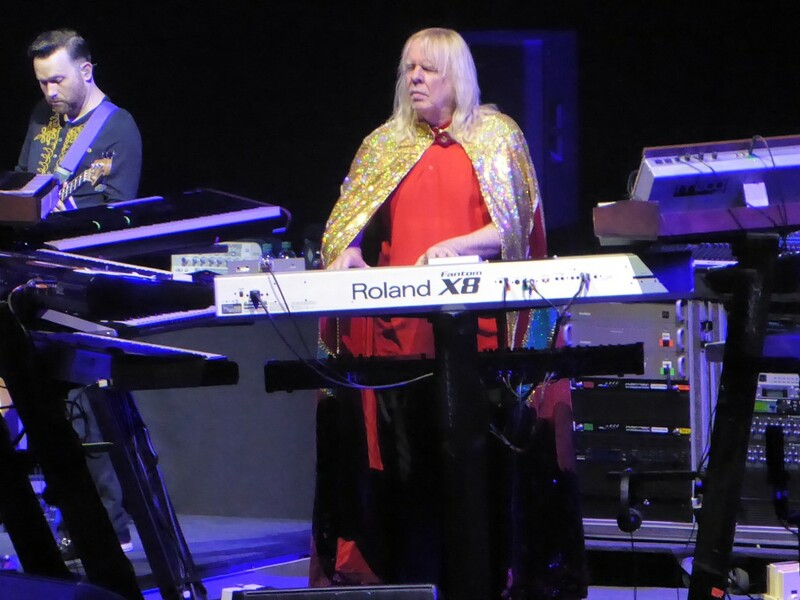 The three main protagonists are an odd trio: while Trevor cut a rather reserved and stooped figure to stage left, Rick Wakeman was very much the visual focus, in red tunic and flowing spangly cape and presiding over the huge variety of keyboards that give Yes such a distinctive sound. 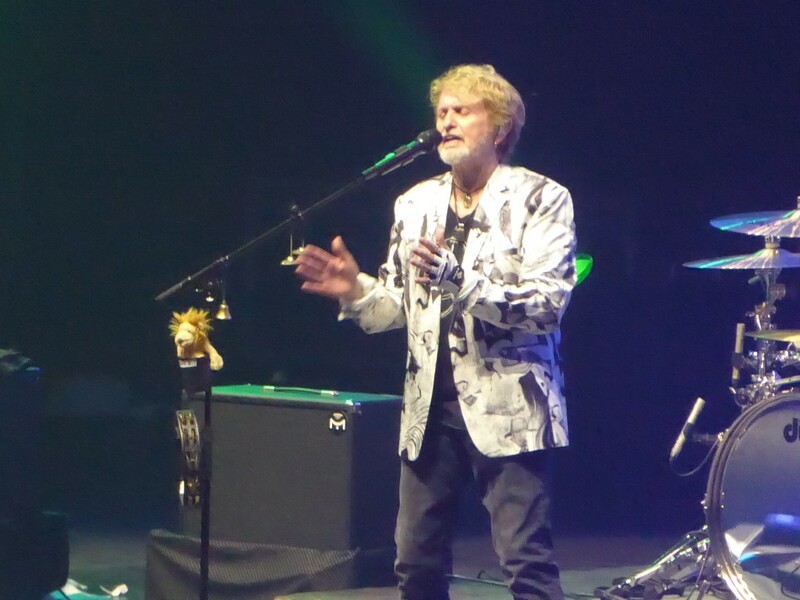 It is great to see Jon Anderson back on stage and another of those distinctive high-pitched voices was in fine fettle, but his small physique and otherworldly musings created the image in my mind of a Tolkeinesque elf. 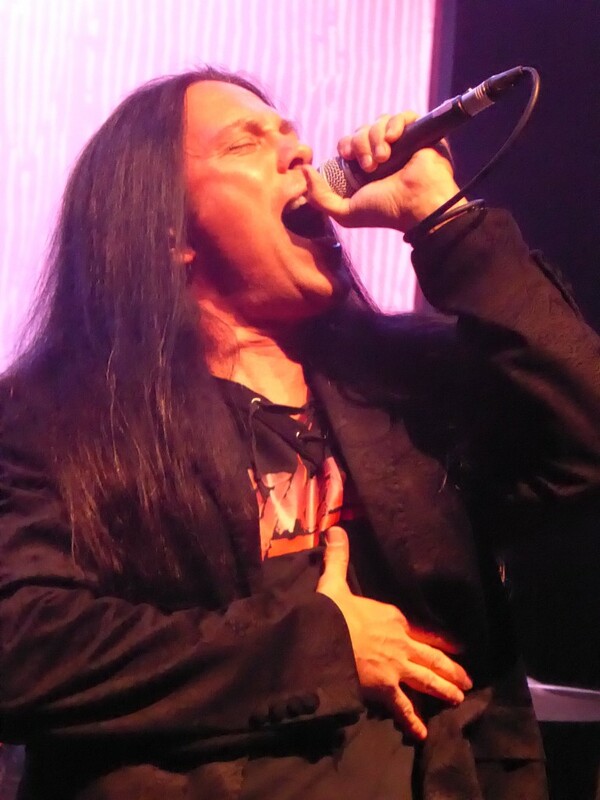 As the middle of the set focused on their more commercial offerings, he allowed Trevor to sing the majority of ‘Changes’ while ‘Rhythm Of Love’ saw the band in a surprisingly danceable groove and ‘I Am Waiting’ was a fine ballad. As the set wore on though longer epics like ‘Awaken’ predominated, with Jon even playing that most un rock n roll of instruments, the harp. 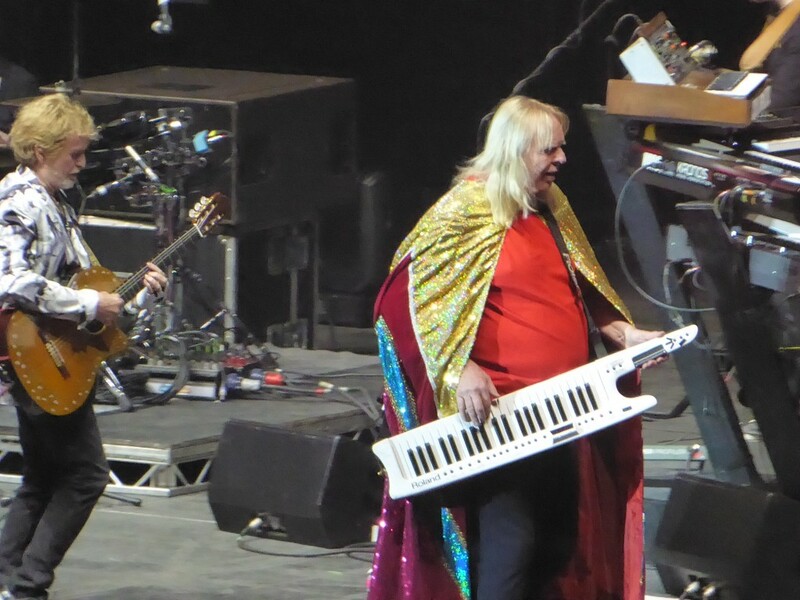 When Trevor played the opening guitar chords to ‘Owner Of A Lonely Heart’ the crowd took to their feet and the band showed a surprising sense of fun: Rick strolled out from behind his bank of keyboards wielding a ‘keytar’, perhaps emulating the other Yes’ keyboardist Geoff Downes’ party piece in his Asia days. I then looked around to see he and Trevor having gone deep into the crowd to play, while they segued into a cover of ‘Sunshine Of Your Love’. There was only one encore, but a lengthy version of ‘Roundabout’ was rapturously received by those who did not have to rush for Sunday night trains home and ended an always interesting and well-balanced 2 hour plus set. 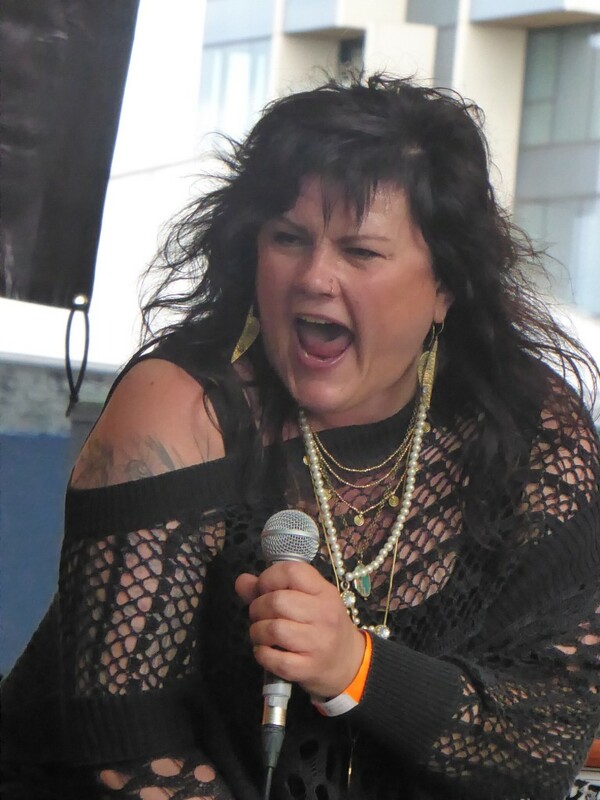 The attendance might have been bigger, but once again Stone Free established itself as one of the most fan-friendly festivals with an impressive variety of bands under the big tent we call classic rock. 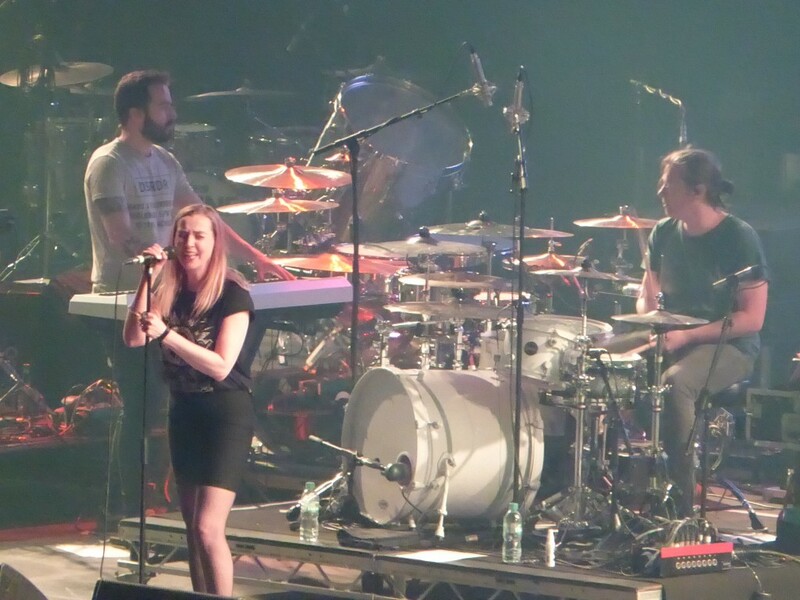 This entry was posted in All Posts, GIG REVIEWS and tagged 17 June, Anathema, Anderson Rabin Wakeman, Bad Flowers, festival, gig, Ginger Wildheart, Jared James Nichols, Joanne Shaw Taylor, Jon Anderson, London, O2 Arena, prog, Progressive Rock, Richie Kotzen, Rick Wakeman, Roger Hodgson, Stone Free, Stone Wire, Supertramp, Trevor Rabin, Tyketto, Yes. Bookmark the permalink.